Emerald Ridge is one of the best kept secrets in Calera, AL. 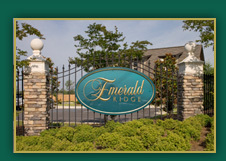 At Emerald Ridge, you can enjoy a lifestyle of simplicity and convenience with all the comforts of home. Emerald Ridge is located just minutes from I-65, Colonial Promenade Shopping Center, City Hall, banks, doctors, theaters, Heart of Dixie Railroad Museum and Timberline Golf - Jerry Pate Designed Golf Course. You can stroll to the George W. Roy Park which features playground equipment, covered picnic area, restrooms and a huge area to walk the dog or play with the kids. Children of Emerald Ridge attend Calera Elementary School, Calera Middle School and Calera High school. For more information, please call Anthony Arnone or Scott Lewis with Keller Williams Realty located at 750 Colonial Promenade Pkwy Ste 4000, Alabaster, AL 35007 205-605-1000 . For pre-approval to purchase call Valerie Springer at 205-995-7283 x 305 or visit website at http://www.vshomeloans.com/ for online application. These homes qualify for 100% financing!